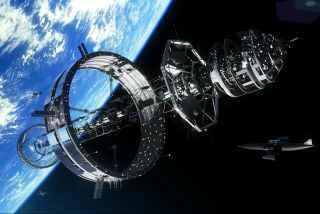 Future starships may be constructed in Earth orbit using a ring-type construction facility, which could have hotel rooms where guests could observe the construction. NASA has granted funding to a dozen imaginative tech concepts, in the hopes that one or more of them will lead to big breakthroughs in space science and exploration. The 12 ideas, which were selected under Phase 1 of the NASA Innovative Advanced Concepts (NIAC) program, are ambitious and varied. One aims to build biomaterials such as human tissue with a 3D printer, for example, while another proposes to induce deep-sleep torpor states in astronauts making the long journey to Mars. Phase 1 awards are worth about $100,000. The selected mission teams will use the money to conduct nine-month initial analysis studies, after which they can apply for Phase 2 funding of approximately $500,000 for two more years of concept development.